SEVEN SISTERS recently released their long awaited and highly anticipated second album via Dissonance Recordings. Recorded in rainy London over the dark winter ’The Cauldron And The Cross‘. Artwork painfully and beautifully painted by Simon Pye Parr of 2000AD / Realm of The Damned fame. The future of British Metal is NOW! 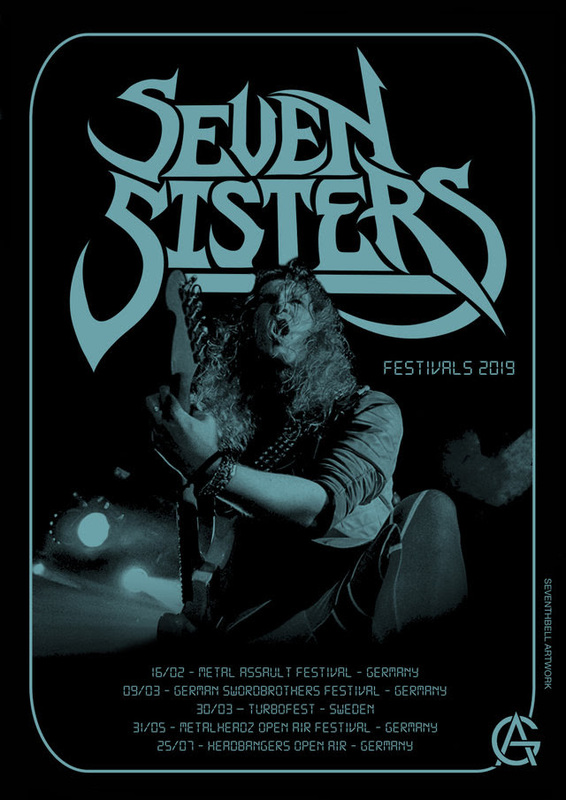 Born in the depths of West London, Seven Sisters are a four-piece band forged from the same steel as the NWOBHM acts of yesteryear. Over the past three years they‘ve gathered a reputation as a stellar act in the heavy metal scene, earning their stripes playing shows all over the UK and Europe off the back of two independent releases The Warden Demo (2014), and the Lost In Time 7” (2015). Their self-titled debut album (2016) was met with rave reviews, and sold out of the first pressing of physical copies in just three weeks. With the all important second album to be released on 13th April 2018, Seven Sisters promise not to just copy the template laid down by the fathers of heavy metal, but to mould their own and usher in a new era.